AGROAgent are authorized banking agents appointed by Agrobank that provides agent banking services of accepting deposits, facilitating withdrawals, fund transfers, bill payments and mobile top-ups. AGROAgent is developed specifically to address the difficulty of obtaining quality banking services, especially for people in remote and rural areas. These services are offered through selected agents nationwide in retail premises equipment using e-POS terminal technology. The syariah concept used for AGROAgent is based on the Wakalah Bi-Ujrah. This concept refers to the representation contract between Agrobank and Agents Agrobank which the Agents act as representatives of the Bank to open the Agent Banking counters for Agrobank by offering services that are agreed to by both parties. The Bank will pay certain wages to the appointed agents for the work done. What is Agrobank Agent Banking services? An alternative banking channels by Agrobank for residents of rural and suburban areas with no / little access to banking services. How is the banking services carried out? Through these banking services, Agrobank will appoint a representative / agent selected authorized to carry out banking transactions on behalf of Agrobank. Transaction will be keyed-in using the POS terminal. Basic banking transactions such as deposits, withdrawals and transfers of funds can be done on site Agrobank Agents. What are the daily operations Banking Agents AgroBank? Daily operating hours are from 9 am to 9 pm (subject to transaction time agent). Does this service use Shariah-compliant banking? Yes, this service is Shariah-compliant banking. Shariah concept used is Wakalah Bi-Ujrah. Wakalah Bi Al-Ujrah refers to the representation contract between Agrobank and AGROAgents, in which the agent acts as a representative to the Bank by opening AGROAgent banking counters for Agrobank by offering services that are agreed to by both parties. Are any service charges charged to customers for the banking channel? 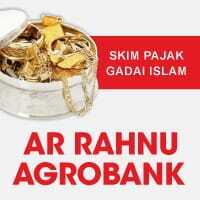 Agrobank not charge any service to the customer for this banking channel. Where can these Agrobank banking agent be found? Agents can be found in the locations of the premises featuring the 'Bank Agrobank Registered Agent'. Address where the agent is also available at Agrobank website. Are banking services offered are guaranteed safe from any form of intrusion data / personal information? Yes, Agrobank assures data security / personal customer information is protected and safe from invasion. Meets the requirements of the security level is set by Bank Negara Malaysia. Are there any transaction receipts issued as evidence of completion of a transaction? Yes, the POS terminal will print 2 copies receipt of the transaction. One copy to the agent and another copy for the customers. Does the reversal banking services allowed for this? No. 'Reversal' banking is not allowed to be made in the system. Are there limitations in the number of business banking services? Where can I find more information on The Agrobank Agent Banking? Where can I find the support service for the banking services of the Agrobank agents?